The Auburn Rotary Club recently received a state-of-the-troop report from Boy Scout Troop 50, which it sponsors. Troop 50, founded in November 12, meets each Monday at 6:30 p.m. at First Presbyterian Church in Downtown Auburn. In addition to weekly meetings, the troop has camped monthly in locations throughout Alabama. 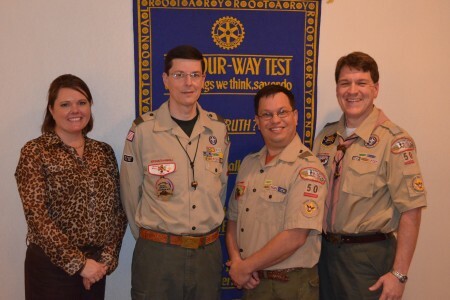 Leaders representing the troop included (from left to right) Scoutmaster Andrew Baird, Troop Committee Chair Rob Stanford, and Chartered Organization Representative and Rotarian Michael Tullier. The three are pictured with Club President Martee Moseley. For information about membership or volunteering, visit www.boyscout50.org.